An interesting idea. I would tend to think is to be way to airy for cold climates. We had a hive of wild bees live in the wall of our house for years, until they were removed. They were getting through a small gap in rough lumber siding, about half way up the second story wall. So they don’t need alot of airiness to be happy. Perhaps a fine screen over a ‘grease or sap pit’ may be more normal. My understanding is that the typical comb base sold has a cell pattern that is larger than what a wild bee would make for themselves. The notions I hear is that causes them to generate a bee that is larger than a wild variety. This may not be favorable genetically, or otherwise, perhaps. 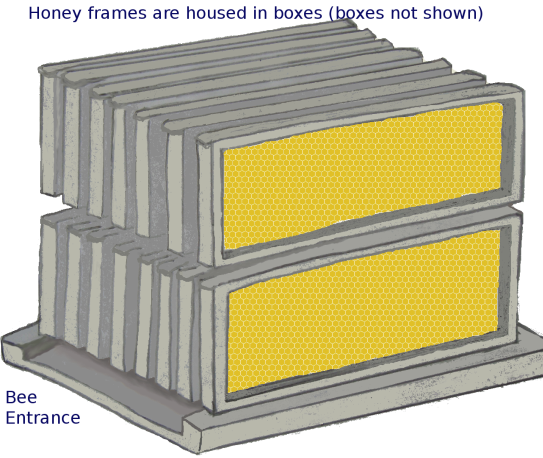 Perhaps providing an empty frame that has only a small piece of old comb stuck to it may be a better way to start more comb. 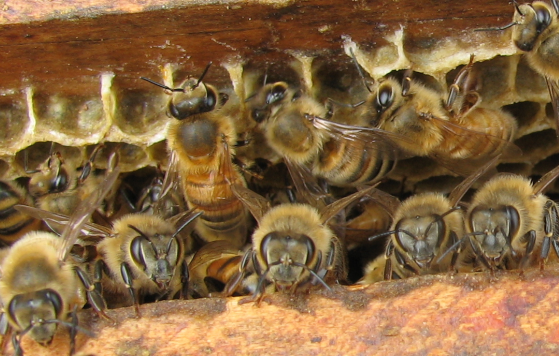 I’ve noticed that in wild hives, the spacing between the combs are rather narrow also. Though irregularity in the surface may also add the the apparant notion. Anyway a “cozier” way of building seemed to persist on the whole, where the space was being actively used. Since they were also next to a heated room, they may have also been less stressed with low temperatures in the winter. 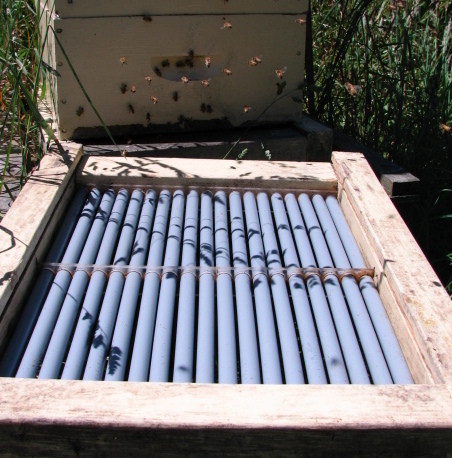 In any case, I often wonder why hives are not insulated and the access way made rather tight most of the time. That way moths and other pest can’t sneak in. A mesh at the bottom quickly gets clogged. 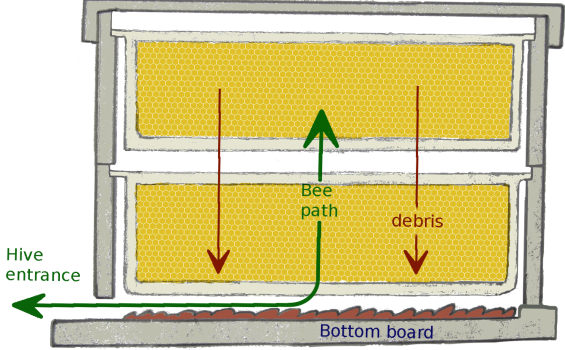 A way to decrease airflow may be to make the bees enter at the middle or top. You can then replace the bottom board with a flap or a funnel to get rid of the organic garbage. Or one could make sure the pipes shown in the photo have a sealed surface below them.